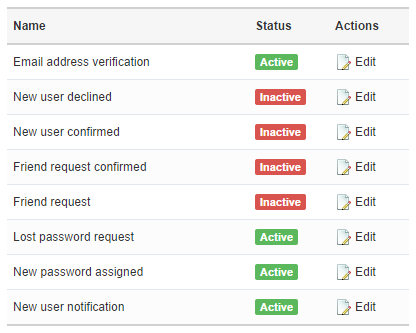 This page allows you to edit email templates sent by the system when certain actions are performed. To view email templates you need to select a plugin you'd like to view them for first. Once you selected a plugin, you will see a list of email templates related to that plugin. If you don't want certain email templates sent, you may disable them here. To edit email template click on "edit" link on the "email templates" page. On this page you may edit email template's subject line, as well as HTML and plain text messages. HTML message will be sent only if you configured your system to use SMTP email protocol for emails. 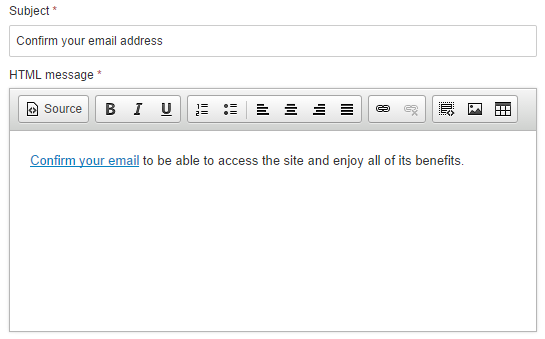 You may also create new email templates that can be used by some of the plugins. For example you may create different welcome email templates for different user types on your site. You may use various tags in the email templates which are replaced with the corresponding values at the time when the email is sent. Each tag consists of 2 words separated by a dot. For example [user.email] identifies the "user" object and "email" keyword and will be replaced with the user's email. The "user" object is available in almost all email templates as contains recipient's user details. Some email templates will contain other objects such as "message" in the private messaging plugin or "invoice" in the billing plugin.